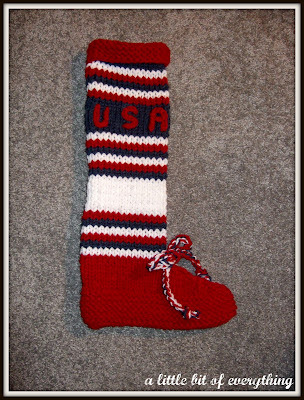 This project was originated by the mother of a National Guard soldier who was in Afghanistan last Christmas. 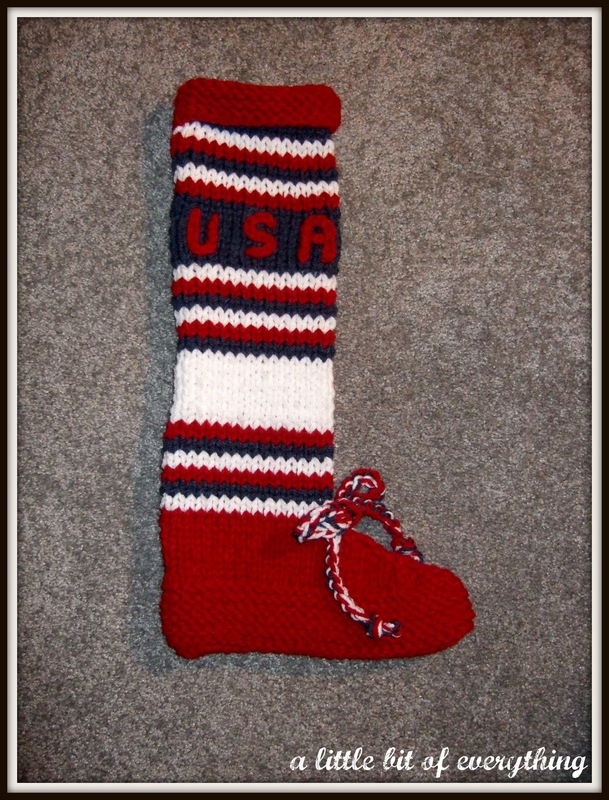 She collected 150 knitted stocking to fill for her son's unit. Pictured are four I made for her and below are the directions which work up quickly. Perfect for anyone to make for their family Christmas stockings. 10 1/2 needles. This project calls for two strands of worsted-weight yarn to create the thickness (work with two skeins). 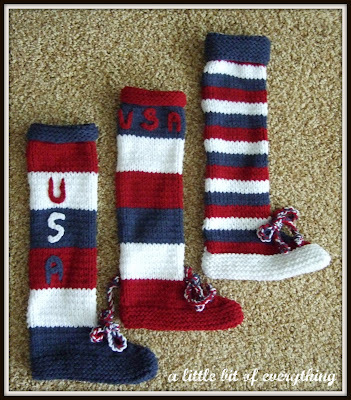 Use any combination of red, white and blue yarn to create any look you want (stripes, contrasting cuff, etc.) Cast on 60 stitches. Knit 12 rows after casting on. Row 1 Knit 27 Knit two together three times. Knit last 27 stitches. Row 2 Pearl 26. Pearl two together three times. Pearl last 25 stitches. Row 3 Knit 24. Knit two together three times. Knit last 24 stitches. Row 4 Pearl 23. Pearl two together three times. Pearl last 22 stitches. Row 5 Knit 21. Knit two together three times. Knit last 21 stitches. Row 6 Pearl 20. Pearl two together three times. Pearl last 19 stitches. Row 7 Knit 18. Knit two together three times. Knit last 18 stitches. Row 8 Pearl 17. Pearl two together three times. Pearl last 16 stitches. Row 9 Knit 15. Knit two together three times. Knit last 15 stitches. Row 10 Pearl 14. Pearl two together three times. Pearl last 13 stitches. After row 10, you will have 30 stitches; continue to alternately knit one row and pearl one row until you have reached a measurement of approximately 12 inches after row 10, then knit eight rows (garter stitch) for the cuff. These are lovely! What a great project for the troops! Beautiful stockings! I've begun a new linky just for stockings (haven't got my own up yet) - you might post these there for more inspiration for others. I love to knit! These are great. Here from Lamb Around! What a wonderful idea. My Girl Scout troop participates in a program where we fill stockings and send them to our troops. A small but thoughtful way to show our appreciation. Thanks so much for bringing your seasonal project to Seasonal Sundays! This is a very god idea and I am sure appreciated. I cannot do that as I never learned to knit. I did a lot of hand work until my eyes keep me from doing it now. Pretty socks! Have a great day. What a great idea! I love how patriotic they are too! Thanks for linking up to Making Your Home Sing Monday! these are great. thank you for hte tutorial. we love to show your project so our readers can find you also! What a great project to send to the troops!! You are an inspiration!! Those stockings are really cute! I'm pretty sure they would be faster to knit up in the round on DPNs or circulars, at least for me, but cute idea. Is there a group collecting these as donations? Did I miss that in the post? Have a great week. Already a follower. What a wonderful idea! I love the thought of letting our troops know they are loved and cared for. I love to see honor given when it is due. Thanks for the patriotric and crafty post. These are another reason why I should learn to knit! Great post :) I'm so happy you joined our Stumble Tumble Tuesdays linky! Hope you stop by and stumble away next Tuesday, too! I stumbled your post as well. Those are adorable! You did a great job! I will place an order for five. hehe. Cute cute stockings! and what a thoughtful idea! Thank you for your contribution to our last week’s DIY Craft Tutorial linky party. The range of outstandingly good projects was delightful. I'm always amazed how many creative talented people there are out there!! http://www.FineCraftGuild.com/diy-linky-party-21/ and will be up in an hour, and I'm inviting you again. Thank you for your contribution to last week's DIY TUTORIAL LINKY PARTY. A new party opens today, http://www.FineCraftGuild.com/diy-linky-party-21/ and we'd love to see what else you've made! I think it is fabulous. I wish I had the knack to knit, my mom tried so hard, but I just didn't get it. I am going to share this with my talented friends, so they can create these wonderful stockings. Glad I found you on BHSJW. What a great idea! I bet the soldiers really appreciate the stockings. I'm visiting from Fantastic Frugal Friday. Oh! God Bless! These stockings are awesome!! I am so glad you are remembering the troops!! Lovely idea. The stockings are wonderful. Btw, I hopped here from la bella vita blog. Please come join my autumn blog hop if you have a moment! These are so cute! Thanks so much for sharing the pattern, too! God Bless you! Amazing! I just learned to knit this year! These look great! Thanks for linking up to Topsy Turvy Tuesday's! Great project and a GREAT cause.